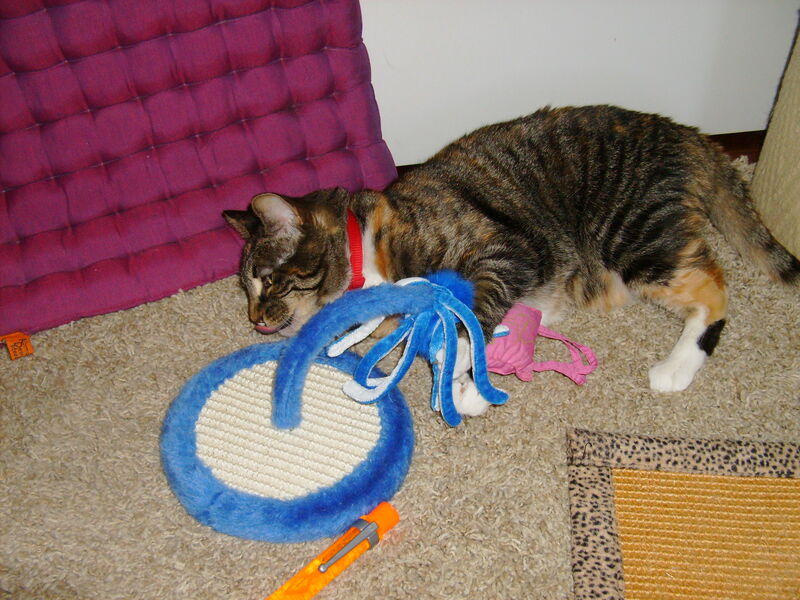 Marcella Mooshie chewing up her new toys. Hello dear anipals and hoomans! It’s been over six weeks since we last posted an entry to the Mooshie blog. We blame our hooman mother for denying us access to the laptop. She had a bunch of lame excuses – “keyboard is frozen” or “we’re having a computer and TV free night.” And, she also left us for 10 days to go to San Diego and took the laptop. Some nerve! So, to maintain a steady stream of creativity we had to scratch our story ideas on the furniture. Hee, hee. Mommie is back home and she brought us some cool kitty presents from San Diego. And now we have commandeered the laptop and plan on blogging up a storm this weekend. Stay tuned. This entry was posted on Saturday, September 4th, 2010 at 12:51 pm and is filed under Feline Lifestyle. You can follow any responses to this entry through the RSS 2.0 feed. You can leave a response, or trackback from your own site.